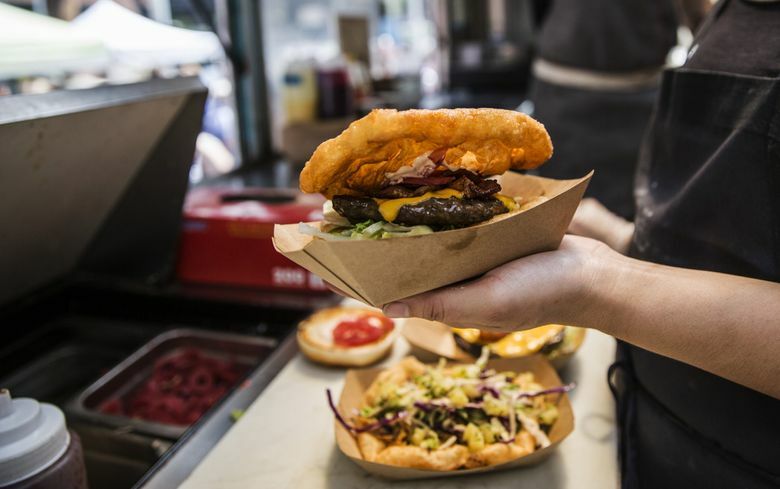 Seattle Street Food Festival in South Lake Union stretches from Mercer Street to Denny Way. The festival will be open until 10 p.m. Saturday and 11 a.m.-5 p.m. Sunday. Admission is free and food costs about $4-$12. At Daniel Chong’s dessert booth at the Seattle Street Food Festival in South Lake Union there is a sign with several warnings. Use the skewer, not your fingers. Blow on each puff at least five times. And don’t drink the residual liquid nitrogen. 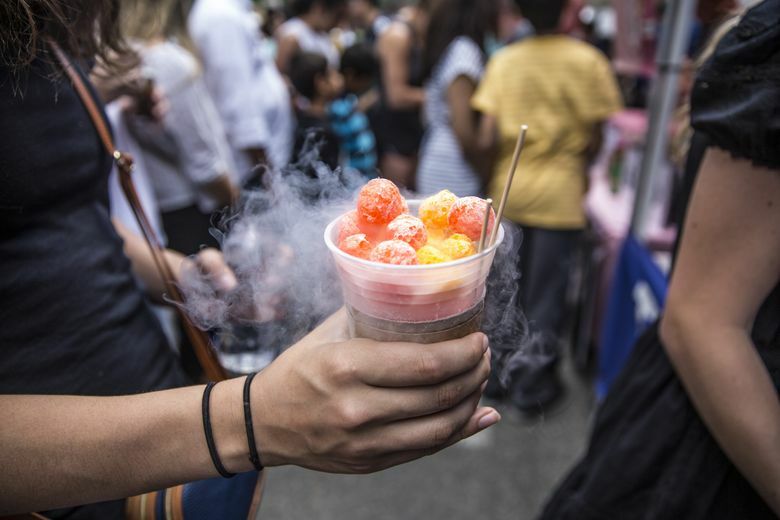 The South Korean sweet puff dipped in liquid nitrogen and called “Dragon’s Breath” is just one of dozens of international foods served at the festival this weekend along Ninth Street. 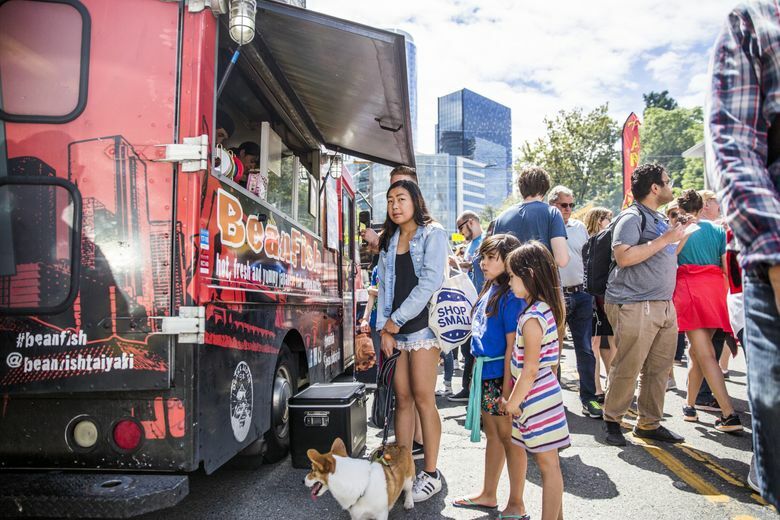 In the five blocks, stretching from Mercer Street to Denny Way, people crowded into lines to order from food trucks and booths. The festival will be open until 10 p.m. tonight and 11 a.m.-5 p.m. Sunday. Admission is free and food costs about $4-$12. 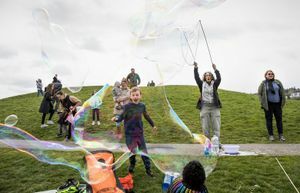 The festival, which started six years ago, celebrates food trucks with unique flavors, said Ryan Reiter, the organizer. “It’s hyperlocal, but globally inspired,” he said. 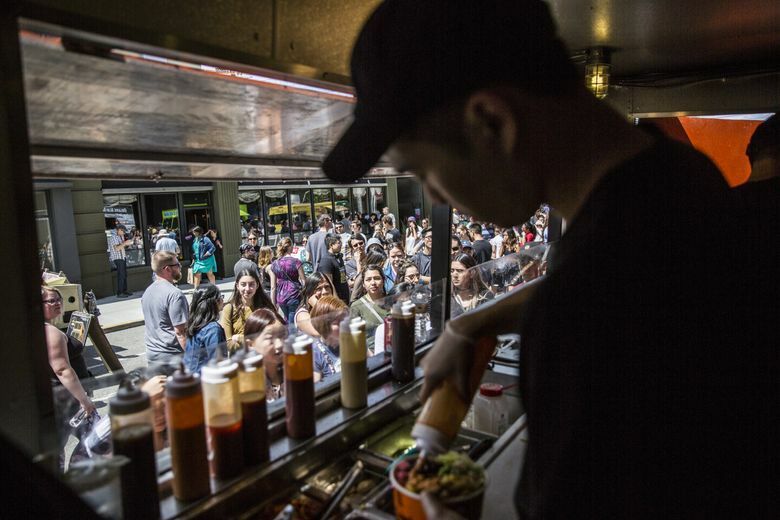 This year Reiter expanded the festival by closing off two more blocks for food vendors. 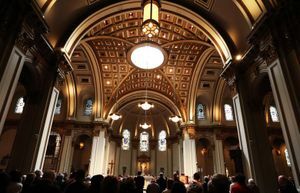 Last year, about 85,000 people attended the event, he added. Chong, 29, and his family started Three Twenty Below several years ago, with the idea of bringing South Korean desserts to Seattle. He gets similar reactions from customers who try the liquid-nitrogen puff balls. “They’re scared at first, then shocked,” Chong said. Many food vendors and truck owners at the festival explain their food is inspired by their ethnicity or the country they or their family is from. Offerings included small plates from places like Japan, India, El Salvador, Ethiopia and Belize. James Chang, 30, also wanted to transport the flavors of South Korea to Seattle. Chang lived in South Korea for four years after graduating from the University of Washington in 2012. He ate his way through the country, wishing his hometown of Seattle had similar street food. That dream stuck with him and he hasn’t had a day off since he opened Seoul Bowl, a Korean BBQ food truck, three months ago. Chang and his wife, Subin, developed the recipes for the build-your-own bowl menu that offers a choice of protein such as Korean beef, spicy pork, chicken or fried tofu with toppings like kimchi, soy egg and smashed sweet potato salad. The Bulgogi Kimchi Cheese Fries have slivers of tender Ribeye marinated overnight in a sweet soy blend piled on fries with spicy Kimchi for $5.50. He admits starting a food truck is more difficult than people might expect. Like the three times their truck broke down on the highway. “Now wherever we go, 30 people are in line,” he said. Sallan Garcia, 19, of Kennewick, was one of those waiting to order at Seoul Bowl Saturday. “I haven’t tried Korean and it smells good,” she said.